Snapchat has today launched a new update which adds Spectacles integration and a new form of their popular Lenses tool. 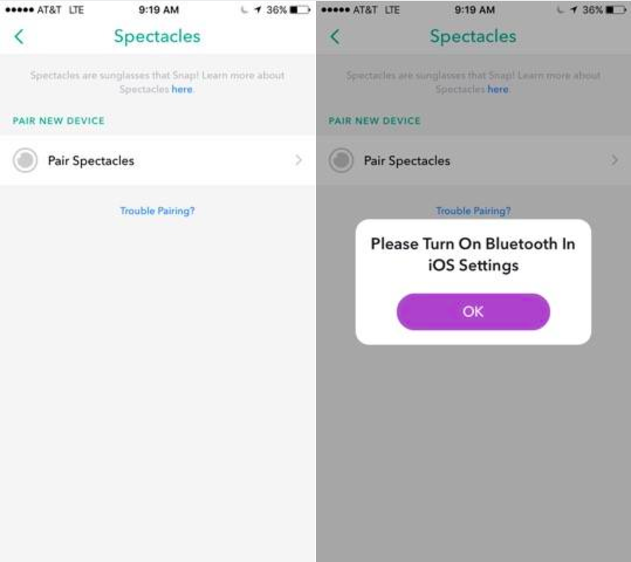 First off, on Spectacles - in the new version of the app there's an additional option under "My Account" which now lists Spectacles as a connection option. The first hardware play from the newly named "Snap Inc.", Spectacles will be released soon on a limited basis, though we don't have much in the way of detail as to just how limited they'll be to begin with. Snap Inc. has said that Spectacles will be priced at $129.99 (est. £100, AU$170) and that the company will seek to get a feel for the consumer response before considering their next move on distribution. The release of Spectacles is a big move for the company, and will likely play a significant role in their ongoing battle for attention with Facebook, who are making a concerted effort to go after Snapchat's user base. Snapchat's status as the must-have, cool app amongst younger users will no doubt make Spectacles a popular option on release, and the limited availability will also add to that exclusive status - few brands know how to fuel user buzz like Snapchat. Along that line, Snapchat's again taking a non-conventional path in promoting Spectactles, including advertising Spectacles via airport check-in trays, which they've also done previously with Snapchat. But the bigger question is what does Spectacles add to the user experience, beyond just being able to more easily capture their perspective? 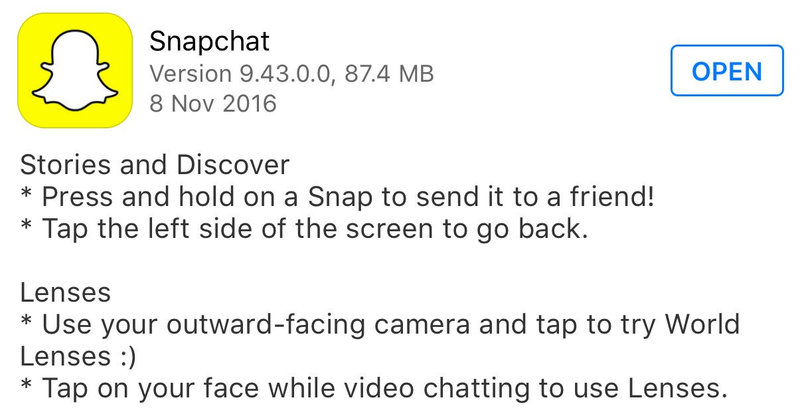 Another element of the latest Snapchat update could point to what the next phase might be, with the addition of 'World Lenses'. This last one may be the best indicator of where Spectacles could, potentially, be headed. Earlier this year, tech investor Jason Calacanis predicted that Snapchat would use Spectacles to show Snapcodes above people's heads and other augmented reality elements, and this new variation of Lenses seems to point in that direction. If there's capacity for Spectacles users to apply such filters over their real world view, this could be the evolution of Snapchat that keeps them in the game with Facebook - and their recent history of hiring experts in VR/AR definitely suggests that there's more to Spectacles than just the basic camera tools on show. Of course, that's not to dismiss Spectacles' unique, 115-degree camera, which is a significant innovation in itself. But the biggest risk facing Snapchat is that Facebook might be able to come out with better, more interesting visual features that could inspire their audience to switch across. Really, part of Snapchat's wider impetus has been that 'need to share' appeal - people feel compelled to show others Lenses and the amazing things you can do in the app. Sure, Snapchat had a dedicated fan base before Lenses existed, but the addition of the tool has lead to a lot more people becoming aware of the app, and becoming users themselves as a result. And Facebook is working on such tools - in a blog post released today, Facebook's outlined how they're using advanced AI within their apps that detect movement within a frame and provide visual cues accordingly - like, for example, taking a picture when people smile or enabling users to swipe across the screen to brush away snowflakes. Given Facebook's wider efforts on virtual reality, The Social Network has much bigger capacity to innovate on this front - the question is whether they have the creativity to beat out Snapchat, which now has an established history of releasing game-changing tools of this type. The increased attention of Facebook won't make it any easier for Snapchat moving forward, but the addition of Spectacles and tools like World Lenses could keep them a step ahead.